I've been in/out - over/under - up/down - left/right all day ... am I coming or going, I'm not sure? What I am sure of is the list! I came up with the idea from JuseBOX on the ARCH forums - and thought mrpeachy's "interactive" LUA script for conky would make a great conky for that! So lets get this straight; not my idea, not my work, JuseBOX and mrpeachy own this. Yup, LUA is more than just a pretty face and eye candy ... it Works for ya! Now I have to try the folding lines one. # WARNING: Change name and passwords on e-mail code if posting!! own_window_title click_log  ##### NOTE instruction in the LUA script! I changed it! ## on blank line after text! Yes, folks - interactive conkys are now available! Conky + lua sure is a lot of fun! Although there is no real practical use to mine other than looking pretty. To deal with this, I wrote the circles that represent a core. The outline of the circle (green) will give a percentage of one thread, while the inside of the circle (purple) will keep track of the second. A core with both threads running at 100% will then look like a circle with a green outline and a completely filled purple interior. I am still playing around with color combos for more ideas. I would like to thank VirtualBox for making 100% cpu usage just one click away. I realized I didn't actually share my configuration. That's not very acceptable. The configuration is actually a bit complicated, as each ring gets its own script that get's called up. This allows for the movement of individual gauges without messing up the rest of the system. My setup uses the lua conky from the aur. Thought I would chuck mine up, it is a bit of a work in progress. # at what point is a pkg considered "important"
pkgTemplate = " %(repo)s/%(name)s %(ver)s"
ipkgTemplate = " *! * %(repo)s/%(name)s %(ver)s"
summaryTemplate = " %(numpkg)d %(pkgstring)s"
isummaryTemplate = summaryTemplate + " (%(inumpkg)d important %(isize).2f MB)"
"""runs pacman returning the popen object"""
The scripts were all found in various places long ago, so I can not give credit to the creators. Also if anyone has any better ways of accomplishing what is done here please let me know. I am trying to set up some "specific" conky config, but I can't find a way to do it. I wish to display a small country flag depending on my IP. What I am trying now, is to run a script in cron that grabs the source from the following page : http://aruljohn.com/details.php. Then it checks for specific string "lu.gif"; "us.guf" or "fr.gif", since my IP can be one of those 3 possibilities. The goal would be to get the country flag corresponding to the current WAN IP saved as flag.gif. Expected result would be to display the country flag in a corner of my screen, next to my tray icons (see screenshot). Right now, the flag is correctly displayed at the desired location, however if I manually change the flag.gif after conky has been started it doesn't update it. I am thinking maybe the image is cached somehow/somewhere. So my questions are. Has anyone done something similar, or do you have any idea on how to achieve this (fixing the 1st script and/or conky loading the update flag.gif image). Maybe it can be done with lua? Since my thread has just been moved to Try this, I hope it's ok if I mention it here. UN.png would be an unknown IP. Still a bit bit WIP but I'm quite happy with it. Now to figure out how to auto start it in XFCE as the wiki way doesn't work for me. Specify a default width and height for bars. Example: 'default_bar_size 0 6'. This is particularly useful for execbar and execibar as they do not take size arguments. I did, it doesn't start (same when putting it in ~/.xinitrc). Made a .desktop according to the wiki, doesn't work (other .desktop autostarts do). Same .desktop file works fine when started once XFCE is running. Ahhhhhhhhhhhhhh the elegance of a simple conky and the complexity of a robotic limb! This, as a startup will see no conky running and run conky, if conky is running it will kill the process and restart it. Mine is a bit more complicated, it starts 8 conkys - some on all desktops others only on desktop 2 or 3. One more tip if I may... a LUA background vs the "image" background. I use to use the "square" image set at certain levels of transparency: bk_10.png, bk_20.png, bk_30.png .. etc etc. Above and After TEXT - requires a composite manager or it blinks. Set 2,3,4 & 5 to '0' to cover the whole window, will change if you change those settings. 6 = 0x000000      color  - make the background any colour you want. and the "background" will have a 5 pixel boarder around the conky. 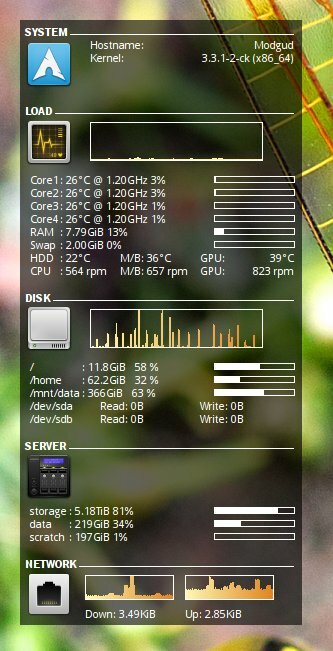 This is inspired by lowph's conky - with a few bits and pieces grabbed from here and there. Is that a TeoBigusGeekus weather script? @viadotas could you post a link to your wallpaper. haha kinda fun. Another simple config. All I need is included.